Our Tenant Find Service is for those landlords who are keen to manage their own properties. Once you have formally appointed us to let your property, we organise all the marketing for you to ensure that your property reaches the widest possible audience to ensure the property is let quickly and with the minimum of fuss. We have assisted many landlords on this basis in the past and they have come back to use our service time and time again. Viewings - We will accompany prospective tenants on viewings and interview them to obtain credit references and guarantees where appropriate. Tenancy Agreement - preparing the documentation required by the current legislation and collecting the deposit and first month’s rent is all part of the service. After that it’s over to you for the on-going management of the property. This option will work best for landlords who want to handle the practical side of letting their property themselves, but want an agent to handle rent collection and negotiations. Collecting Rent - This is one less thing to worry about. We will collect rent on your behalf and pay it over to you by bank transfer less our fees. Rent Management - To make your life easier, we will monitor payments, issue statements and inform you if your tenant should fall behind. Plus we will hold your tenant’s security deposit in a government approved scheme and arrange an inspection at the end of a tenancy, if we have prepared the original inventory. Many landlords appreciate how our Fully Managed service takes away all of the day-to-day stress of letting, without losing any of the control. We repair and replace up to an agreed limit, and simply pass each month's rent on to you. 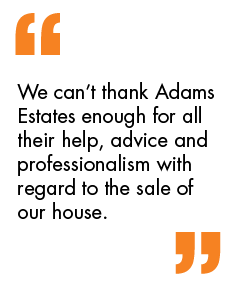 Managing the Deposit - By law the tenant’s deposit is required to be held within a government approved scheme and at Adams Estates we use The Deposit Protection Services. If there is a dispute at the end of the tenancy this offers a quicker way of resolving it, without the need for court action. During the Let - We regularly visit the property and provide you with updates. When minor repairs are required we will arrange for these to be carried out on your behalf. Termination - We will contact you before the end of the tenancy to discuss your future plans. If the tenant is moving out, we will arrange a full inspection and inventory check before releasing their deposit upon your approval. If you are a first time landlord or one with many years’ experience, our Full Management Service will offer total peace of mind. Rent Protection - gives you peace of mind that you won’t lose out if your tenant can no longer pay the rent. When you take out a policy, we also provide you with a legal expenses policy that will help cover the cost of legal fees when seeking to evict a tenant. Landlord Boiler Cover - Free boiler breakdown cover with unlimited 24 hour call outs.